All human beings, wherever they are born, in whichever country, whichever continent, are submitted to the same genetic laws. Even if our personal genetic code is unique, the Human Genome Map is universal. When you are concerned by a rare genetic disease, staying inside your native borders may be synonymous to not being taken in charge of by scientific research, and living with great loneliness. Setting up contacts with sufferers and their families worldwide allowed isolation and loneliness to be broken for each one of us. Most of all, doctors and scientists have understood a research was possible because there were enough cases. 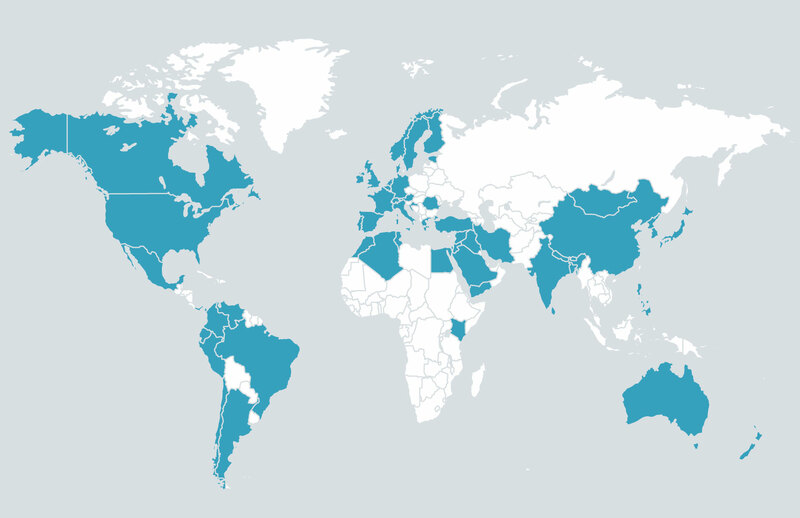 All continents are represented among our members : Europe, America, Oceania , Asia, and Africa. The different available documents concerning Cutis Laxa talk about more or less 100 cases, described in the medical literature, worldwide. One should also note that there might be some cases which are not diagnosed, or only recently so. Today we know there are lots more than 100 sufferers. Many of them are still alone. Must they go on staying alone ? If you happen to know about someone with Cutis Laxa, during a travel, a meeting, please give our name and address. It’s important for this person, it’s important for us, it’s important for research, it’s important for you.